Have you ever gone to a spectacular party and wondered why it stands out from all the rest? The conversation is natural and lively. The food is delicious. And you walk away wondering why all parties aren’t this fun. That’s how I felt last Saturday when my friends Lori and Sarah King invited me to a tea at their home in Connersville, Indiana. The very idea of a tea party fills me with longing. It is such a civilized practice that it makes happy hour seem as scary as a psychotic cousin whose whereabouts are unknown. I hadn’t seen the Kings in months and I immediately said yes, even though I had a million things to do. I’ve been reliving and savoring that experience every since, marveling at their special powers of hospitality. My precious friends have a knack for throwing a party. What can we learn from them? Make it look effortless. When I arrived, a buffet was set with beautiful china and a feast of scones, finger sandwiches, sweets, and quiche. Everything ready to go. Well-planned without seeming fussy. Lori and Sarah were so relaxed that neither seemed as if they felt a bead of perspiration while pulling things together. Guests are more comfortable when they are permitted to believe in the happiest illusion of all great parties: that the hostess hasn’t worn herself out with party preparations. Make guests feel important. Lori and Sarah welcomed every guest at the door. When everyone on the list was accounted for, they began a sincere and thorough introduction of each guest, enumerating our virtues and explaining our personal connection to them. Many of us had never met before, but that gave us a framework for starting conversations with each other. We all came with the highest recommendations possible. If there’s a better way to help people form new friendships, I’ve never seen it. Successful hosts are not only great friends; they’re great connectors. Include a variety of people. There’s nothing more precious than an old, enduring friendship that has weathered the victories and storms of life. But people go to parties to make new friends and deepen relationships with others. It’s much more stimulating to invite a mix of people than sticking with a guest list made entirely of friends who already know each other. The invitation list for last Saturday’s tea included people of all ages, from far and wide. I had rich, meaningful conversations with several women. Among them was a widow in her 80s who shares my professional background and a twenty-something graduate student who works at a museum near my home. Their company refreshed my soul. That’s one of the secrets to a well-planned party. Your guests walk away invigorated by new people and ideas. They leave thinking, “Wow, I’m so glad I came.” I’m sending a special thanks to Lori and Sarah for giving the old English tradition of tea a lovely, contemporary twist. As the actress Carole Lombard once suggested, anyone can throw a party, but not everyone can make it as fun as you did. My cupboards are full of teas, some that I receive as gifts, some that I buy online and some that I’ve found in the grocery store. Where do you buy your tea? 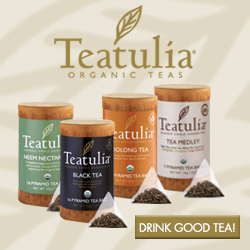 If you’re a tea drinker, you might enjoy Teatulia Tea Store, my newest source for tea. I’m in love with the Teatulia backstory as much as its organic tea, which is grown in Bangladesh’s first USDA certified organic garden, using only natural weed and pest control. This cooperative was started in 2000 as a sustainable enterprise to help people in Bengladesh earn a living. It got its start as a dairy operation. Here’s how it works: Co-op members receive a dairy cow and repay the loan with milk and cow dung, keeping a portion for their own families. Over time members increase the size of their own herds from their labor without tapping micro-credit alternatives that have financed so many Bangladeshi enterprises. The concept eventually became so successful that Teatulia branched out with an organic tea operation, using sustainable farming and packaging practices. All tea sales help Bangladeshi families rebuild a local ecosystem and support social programs for health, education and adult literacy, and cattle-lending programs. Cool, huh? 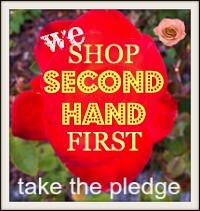 They are offering free shipping on any order through the end of the month. All my librarian and bibliophile friends, listen up: they also have a library project you can support. I’m challenging all my tea-drinking followers to go to that link and make a donation today. Check out this great video, which explains their unique approach to growing tea. What’s your favorite variety of tea? I’ve always been partial to black teas, but it’s so fun to taste new ones. I have not tried Teatulia Organic Lemongrass Herbal Infusion, for example, but I’m anxious for a sip. I’m told that it’s simply delicious before bedtime without a drop of honey or sugar added. I recently added Michael Harney’s book, The Harney and Sons Guide to Tea to my personal library. It’s a marvelous resource for tasting and brewing tea, written by a master blender who shares everything you want to know to become a real tea connoisseur. This book would make a sweet gift for your favorite tea drinker, who might just become a tea expert after reading the book. What’s your favorite tea tradition? Which is better: sharing a cup of tea with a friend or having a small tea party? Wonderful tribute to a great party (and two fine ladies). I am so trying to be ready to greet my guests at the door calmly, rather than running to the door still dripping from the shower. Honey, I know what you mean! I’m always a nervous wreck when I’m entertaining…I haven’t mastered a calm demeanor. Guess I’ll just have to practice more. Leave a reply on "Three tips for hosting a successful summer tea party"